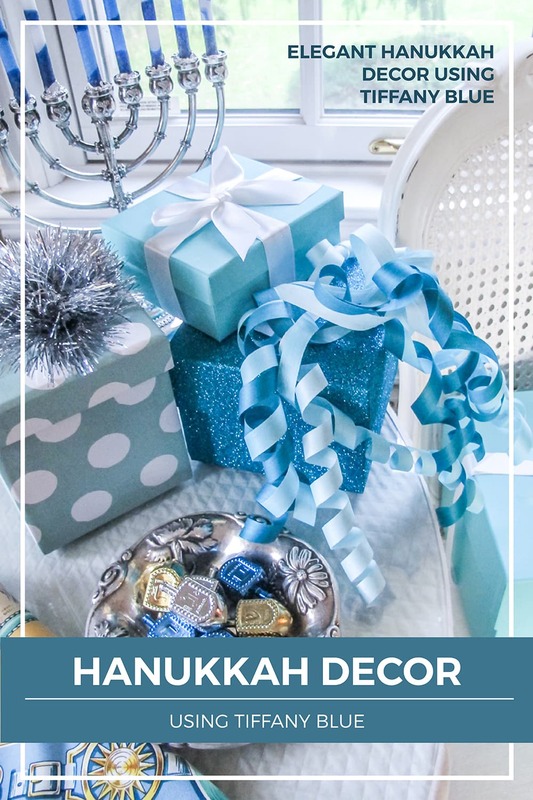 Hanukkah is known as the Festival of Lights. 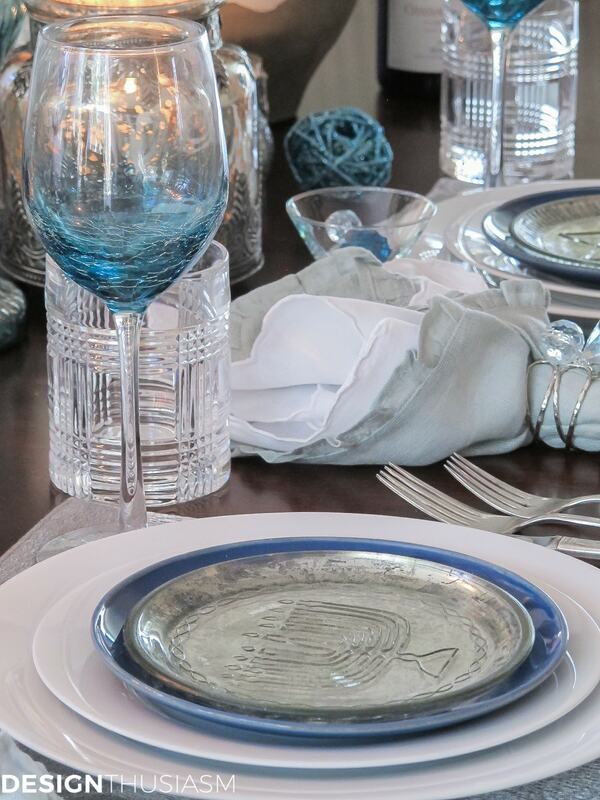 It’s the perfect time to set a beautiful table in peaceful blues punctuated with various sources of lovely candlelight. A joyous holiday with songs, gifts and special foods, it’s a delight to set a table for this celebration. 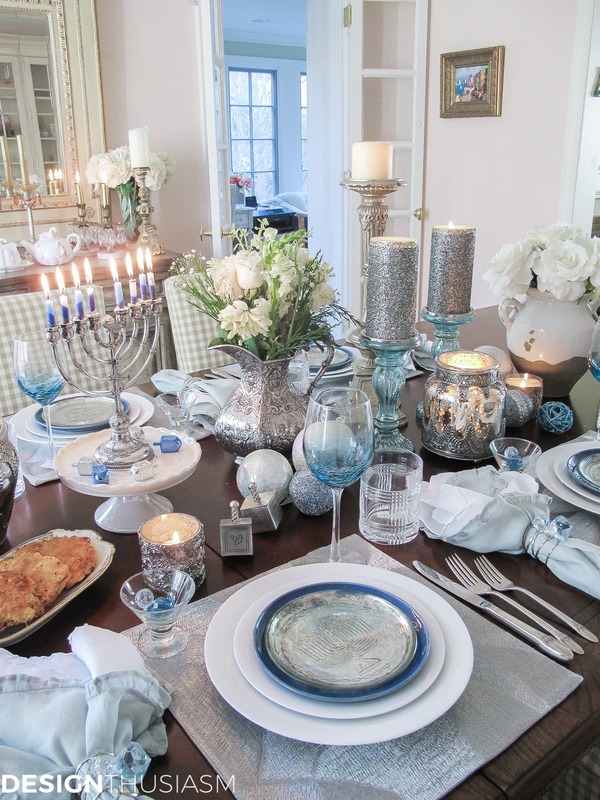 Come join me for a tour of my Hanukkah table setting. 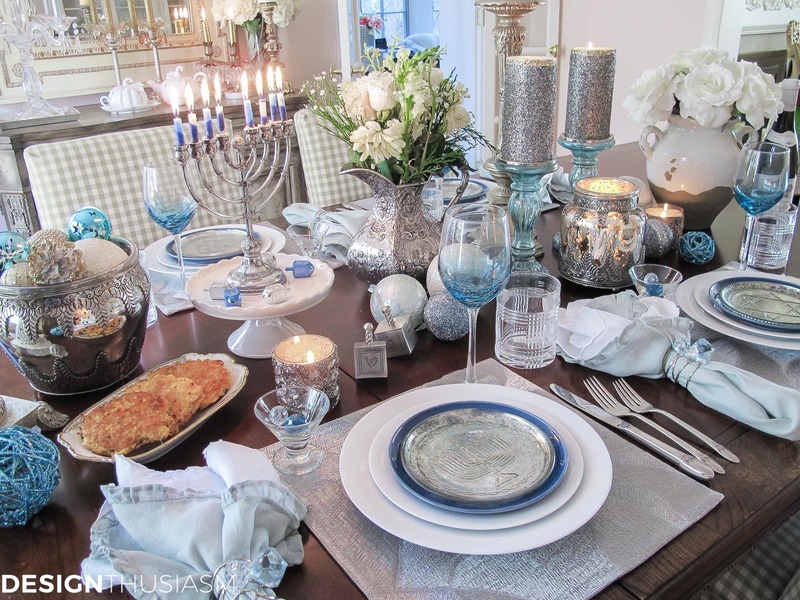 At the heart of this tablescape is a set of mercury glass plates with assorted Hanukkah motifs. 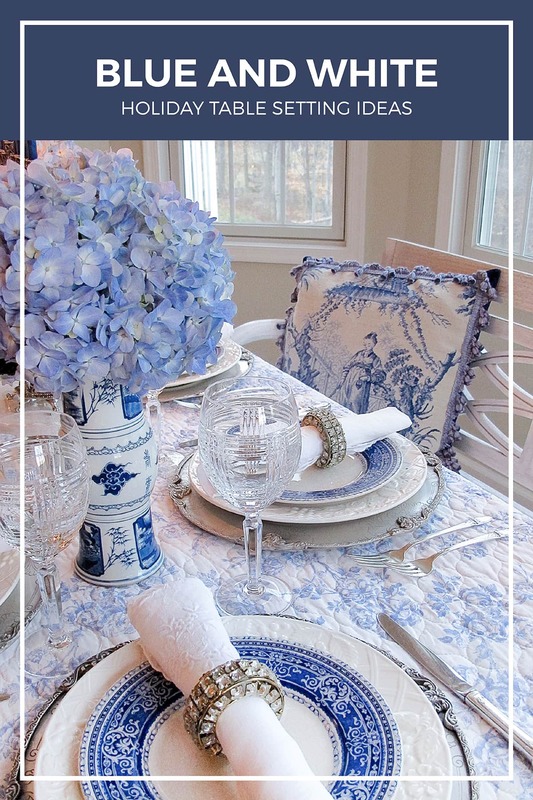 They help anchor the palette of silver and blue and look perfect in the plate stack against cobalt salad plates and white dinnerware. 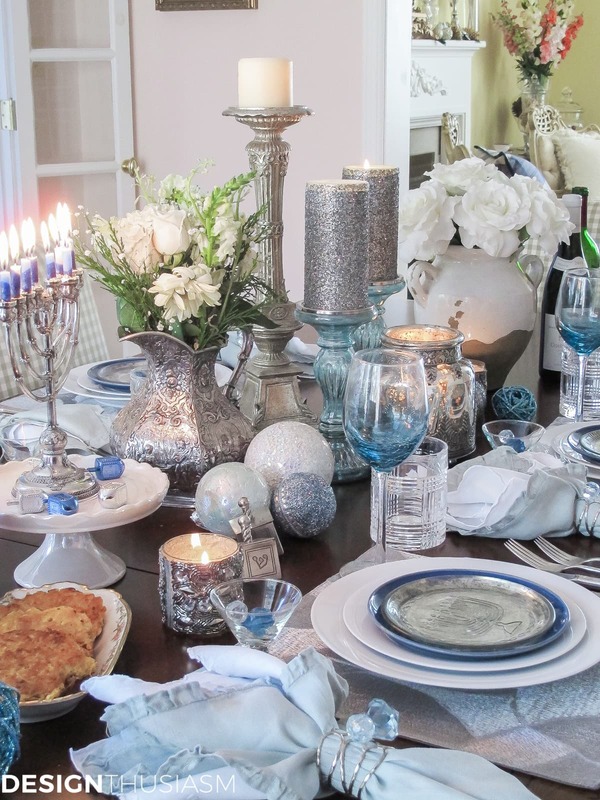 Candlelight is the most meaningful part of this Hanukkah table setting and can be seen in various spots, from the glitter dusted pillars to the little tea lights. 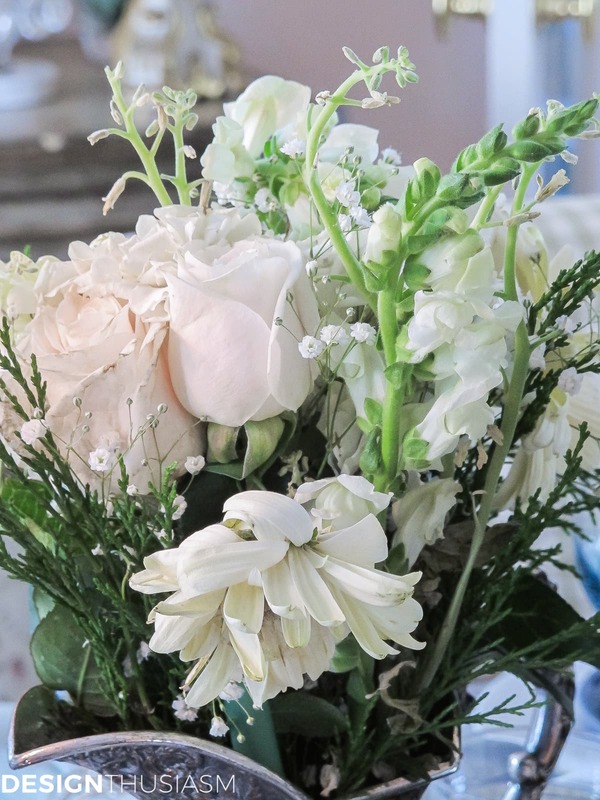 Fresh flowers in a range of whites complement the look and are served in a silver repoussé pitcher. One of the most traditional dishes for a Hanukkah celebration is potato latkes, as the oil they are made with represents the oil in the temple menorah. They are often served with applesauce and these little dessert cups are perfect for such a condiment. 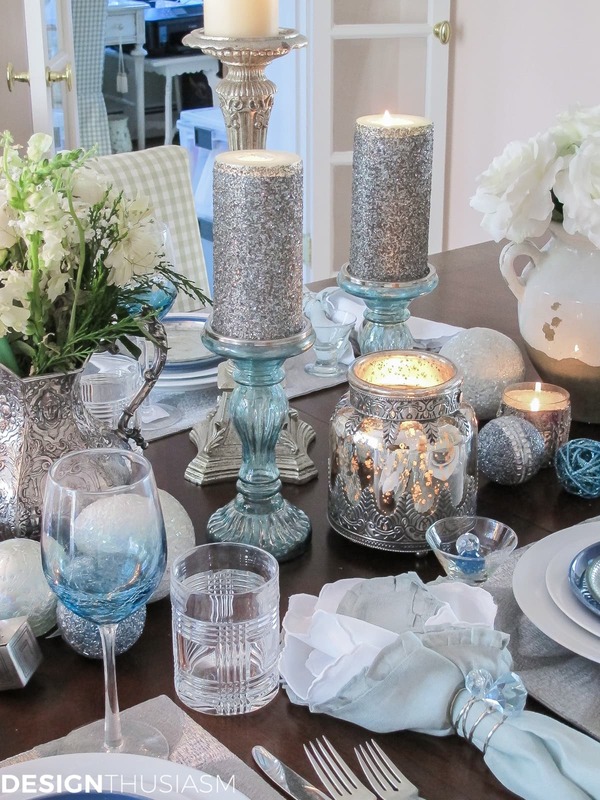 A beaded votive adds a touch of shimmer to the scene. I’ve shown this menorah in some of my other posts, as it’s favorite of mine that was purchased on a trip to Israel. Many people will light several menorahs and I, too, have a few, but this silver one works best with this holiday tableau. 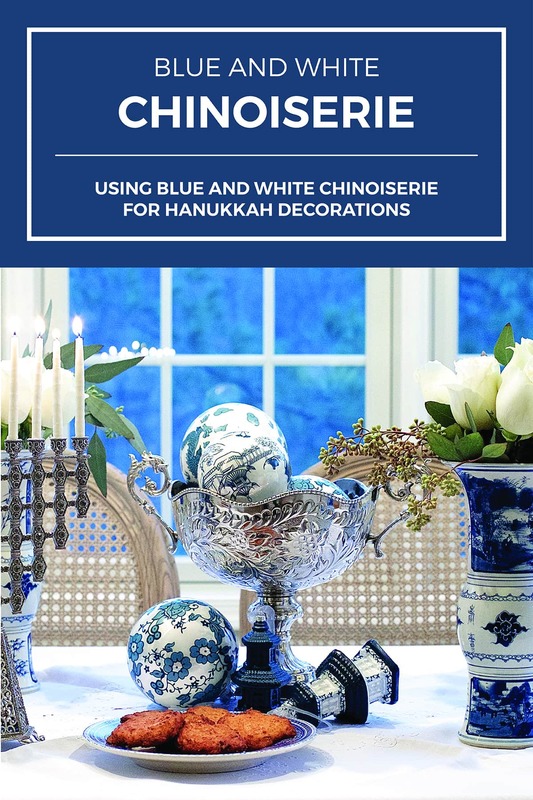 The addition of blue ornaments on store shelves has helped add a really festive look to my Hanukkah table setting. They add a lovely note of holiday glimmer. The dreidels are actually salt and pepper shakers, but are another symbol of this holiday’s traditions. 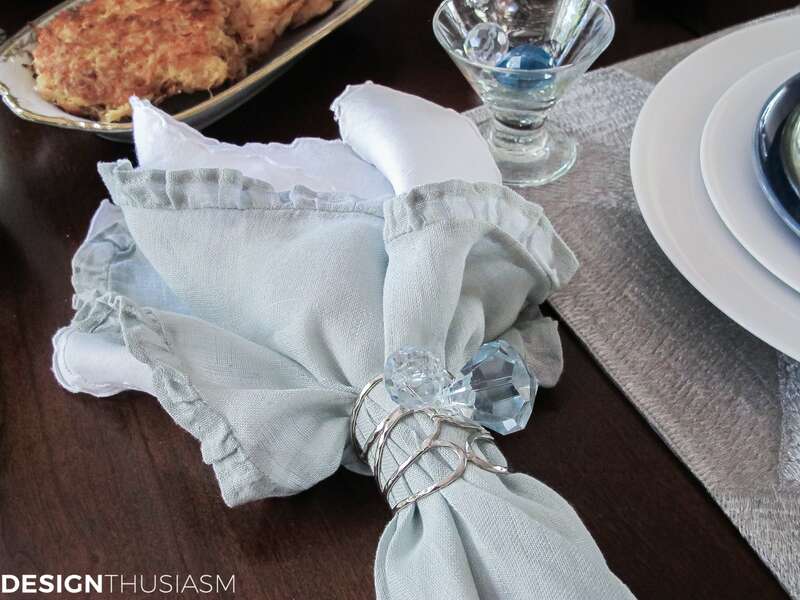 I love to use layered napkins as they lend a rich look to a table. The more lush the fabrics the more I enjoy them. The blue linen has a delicate ruffled edging and the white underpinning has gorgeous tonal embroidery. Napkin rings are often my favorite place to add in some DIY and in this case I used jewelry wire to attach the large aquamarine beads. The foundation this is all built on is a jacquard placemat in a metallic silver. The square shape leaves plenty of room for the beauty of the wood table to show through. 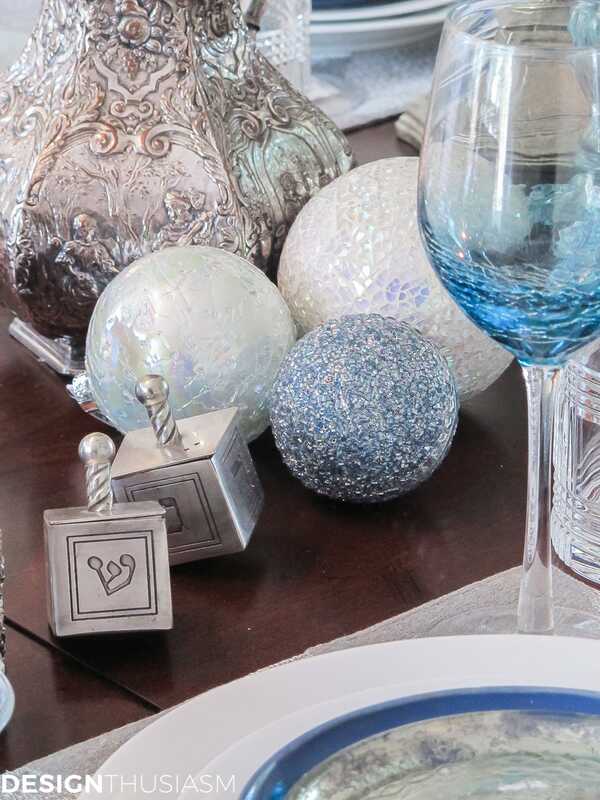 The mercury glass cachepot is filled with more sparkling ornaments and the silver flatware is a family heirloom. 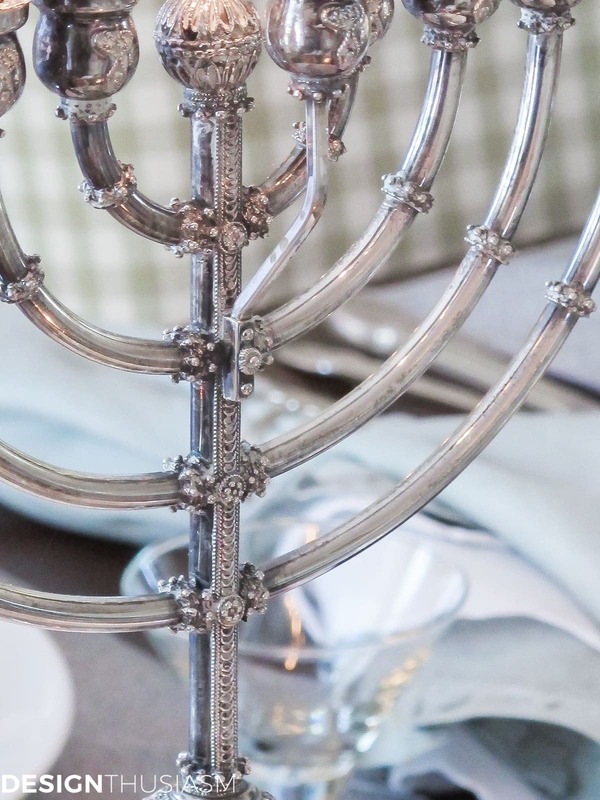 The menorah is raised to prominence on a simple iridescent white cake stand with smaller dreidels scattered at the base. You actually would not see a menorah with all the candles lit unless it was the last night of Hanukkah. 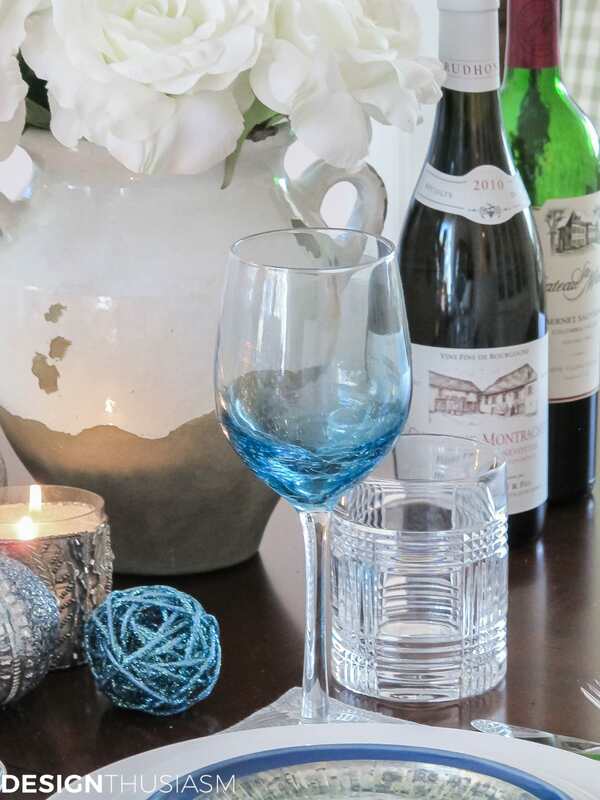 The blue crackle wine goblets do a wonderful job of bringing out all the blues on the table. Glen plaid crystal water glasses help catch the reflecting light. 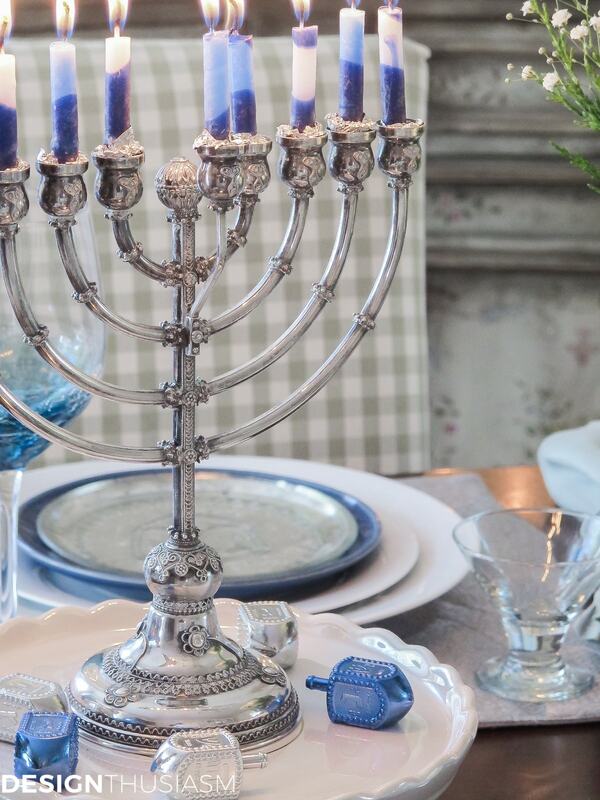 Hanukkah is a celebratory holiday and is a fitting time for a family meal, with vibrant conversation to match the brilliants candle lights! Beautiful table, so thoughtfully put together. I think that is the most beautiful Menorah I have ever seen. Oh, thank you so much!! I do love the menorah, but it’s difficult to light the candles. It’s really meant for oil. Thanks for visiting!! Your table is so lovely! I have pinned it! 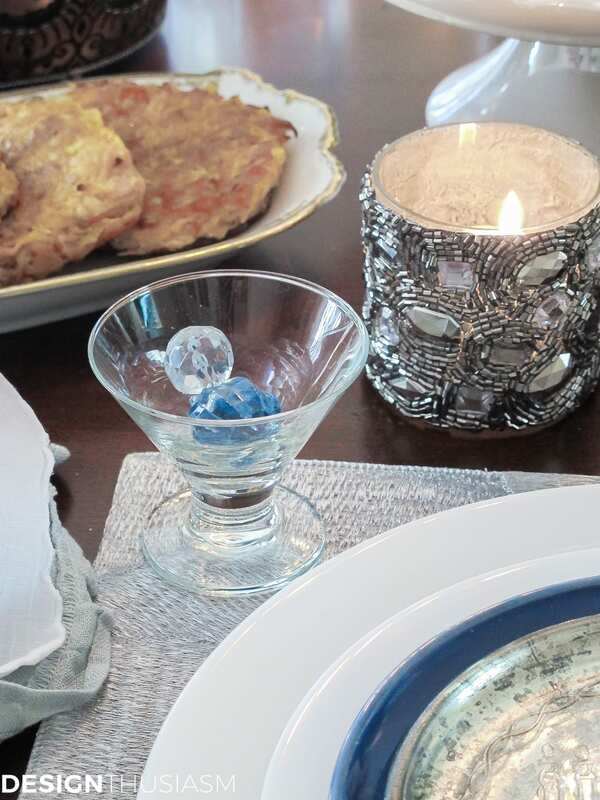 The dreidel salt and pepper shakers are so unique, and I always love your crystal, one of my favorite patterns ever! Happy New Year! Thanks so much Chloe!! Thanks for always stopping by and leaving such great comments. Wishing you a very Merry Christmas and a Happy Healthy New Year! Your table is truly stunning. Really beautiful and perfect for Hanukkah. Thank you so much, Nellie!! Thanks for stopping by and taking the time to comment… 🙂 Happy Holidays to you!! Oh my gosh Lory! You design a table like no other, this is stunning. This tablescape is absolutely beautiful! What else is there to say? I agree with all the lovely comments made. Blue is my favourite colour and pairs with white to perfection, and I just love the way you have designed your table to perfection!!! Kaz, Australia. Your table is simply beautiful. I love the blues and the whites!